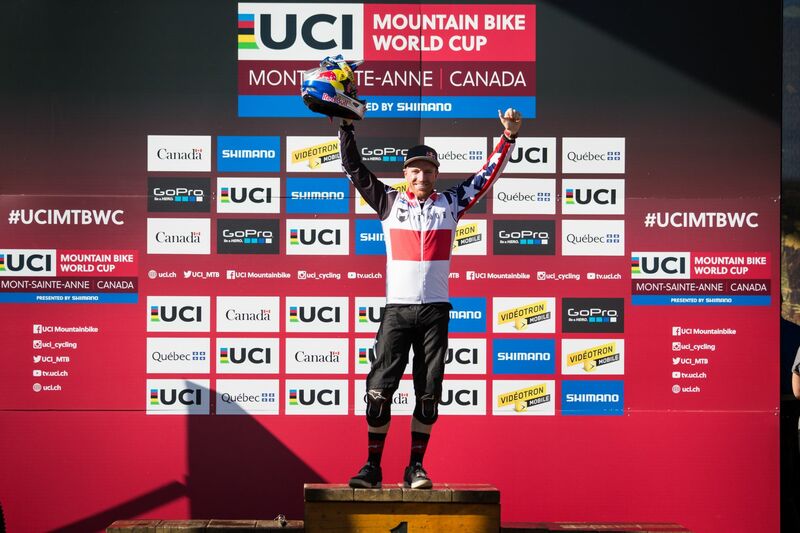 Aaron Gwin scored his 6th straight podium result here in Mont-Sainte-Anne Canada and retains the lead of the series going into the final round. Posting the fastest time in qualifying and finishing 2nd in today�s final means the American needs to take the battle with Britain�s Danny Hart to Andorra, for the 7th and final round of the World Cup series early next month. In qualifying Aaron was the only rider to go below the 4 minute mark and had a healthy 3.6sec buffer over his nearest rivals. In the finals today, starting last and with Danny Hart already in the hot-seat with a sub 4 minute time, Aaron had a slower than normal first sector putting him in 5th place, but fought back to 2nd place by the 2nd sector. Despite pulling back some more time, the final margin of 0.669secs gave Hart his 2nd win of the season and means that he is the only rider that can now challenge for the title. The gap between the two riders is 178 points and there are 250 points available in Andorra. 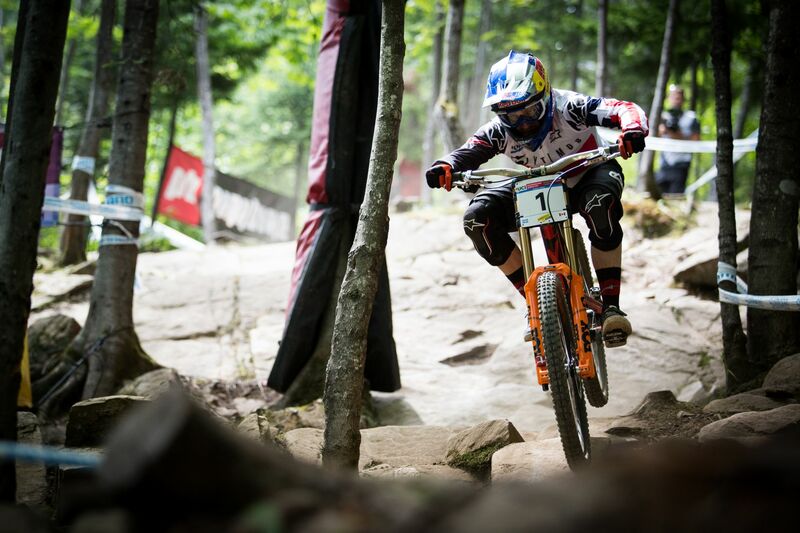 Stoked on another solid weekend here in Mont-Sainte-Anne. It was another close second place for me but I feel I�m making progress every race and my speed is improving. The last few races runs have been solid but I know I�m capable of a little more so I�m definitely looking forward to the last few races of the year. Thanks to everyone for all of the support, it continues to be an awesome year and I�m enjoying every bit of it: On to the next one! Meanwhile Aaron�s team mate Angel Suarez had a very solid final improving his time by 10 seconds from yesterday�s qualifying, and jump up 30 positions to take 36th, his 2nd best result of the year. 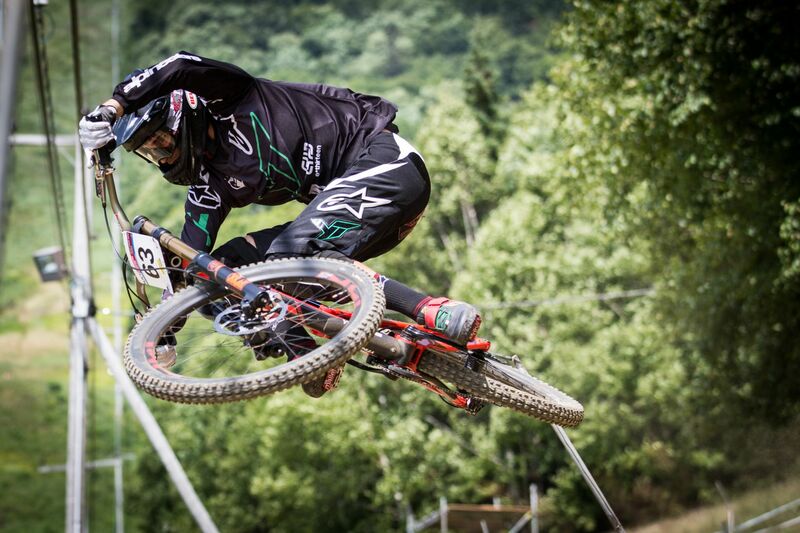 The team�s next major event is the 7th and final round of the UCI World Cup in Vallnord, Andorra, on September 2 and 3.